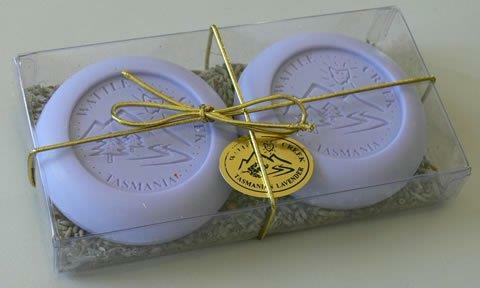 Tasmanian Lavender Twin Pack Vegetable Soap. Wattle Creek embossed Tasmanian Lavender soap in a twin pack. Packed in a clear cello gift box on a bed of lavender flowers. Perfect for those that need a classy gift from our unique Island State.